Christopher Pearse Cranch was an American writer and artist. He painted landscapes, still life and portraits and his work still commands high prices at art auctions today. He wrote several fantasy books for children – most famously the Huggermugger books – as well as his volumes of poetry. Cranch was born in the district of Columbia on March 8th 1813 the son of William Cranch who was Chief Judge of the United States Circuit Court in Columbia. Cranch had one brother but nothing appears to have been written about his mother. He was educated at the George Washington University followed by Harvard Divinity School. After this he joined the Unitarian Ministry (Unitarians believe in the theory that God is one entity) and he travelled extensively across the northern American states preaching. Cranch left the Ministry in 1840 to dedicate himself to his painting. At the same time he pursued employment as writer of children’s books, as a magazine editor and as a caricaturist. He needed to earn money and pay his bills after all, particularly after he married. His caricatures of Ralph Waldo Emerson were used as illustrations of the New Philosophy: Guide and his poems were published in The Dial and The Harbinger, among others. Cranch’s departure from the Ministry came about due in part to his membership of the Transcendental Club, which included amongst its members Ralph Waldo Emerson. It was described as a ‘body of liberal thinkers’ agreed in nothing but their liberality.’ Much of their philosophy derived from their frustration with the Unitarian Church and with the intellectualism at Harvard University. The Dial was a magazine concerned with cultural and political aspects of the US which was published by the Transcendental Club. Cranch was very much involved in editing and contributing to the Club’s publications. After 1846 Cranch and his wife left New York and went to live in Italy for three years where he devoted himself to landscape painting. Between 1849 and 1873 they lived a fairly nomadic existence, flitting between New York, then Paris, then New York again. 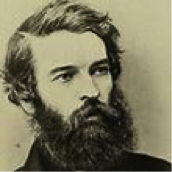 From 1873 he and his wife returned to Cambridge, Massachusetts where he died on January 20th 1892. He is buried at Mount Auburn Cemetery in Massachusetts.